The M112 E32 V6 engine replaced inline 6-cylinder M104 E32 series on the production line in 1997. The new 112-series includes the following engines: E24 M112, M112 E26, E28 M112, M112 E32 ML, and M112 E37. The engine is designed in V configuration (the cylinder bank's angle is 90 degrees). That is allowed to unify mostly all essential parts of the V8 M113 engine. The M112 E32 has the balancer shaft. The cylinder block is aluminum, instead of heavy but reliable cast iron. The engine has aluminum cylinder heads with one camshaft in each head (SOHC) and three valves per cylinder (two intake valves and one exhaust valve). Also, this engine was equipped with variable valve timing system, hydraulic lifters/tappets, variable geometry intake manifold and timing chain. 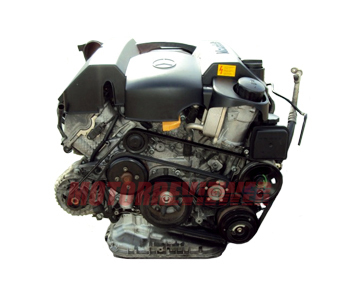 The next step in the development of V6 Mercedes engines became the M272 KE/DE 35 engine appeared in 2004. 1. High oil consumption. The cause of the severe oil consumption is often the wear of valve stem seals. The next variant is contaminated ventilation of crankcase gases. 2. Oil leaks. The weak point in the M112 is the seal of the oil heat exchanger. M112.940 (1997 - 2003) - version with power of 218 hp at 5700 rpm. This motor for Mercedes-Benz CLK 320 C208. M112.941 (1997 - 2002) - for Mercedes-Benz E 320 W210. Power is 224 hp. M112.942 (1997 - 2005) - M112.940 for Mercedes-Benz ML 320 W163. M112.944 (1998 - 2002) - M112.941 for Mercedes-Benz S 320 W220. M112.951 (2003 - present day) - version for Mercedes-Benz Vito 119/Viano 3.0 W639, 190 hp.